Out of the blue, old friends from America emailed to arrange meeting, as they do whenever they come to the UK which is pretty often. Last time they took me to the National Gallery for lunch and then whisked me off to the Savoy (where they were staying) for tea, although truth to tell we had so much to catch up with that we scarcely gave more than a glance at our environment. This time I invited them to our packed little house, which was already swollen by the (welcome) addition of daughter No 2. They were themselves staying at George Gilbert Scott’s St Pancras Hotel and I was quite tempted to say we’d go to them, but it was our turn to be hospitable and coming to us they would also see other members of the family so, to Islington they came. We first met them when my children were at primary school in west London. They appeared at the school en famille while the father was completing his doctorate thesis at UCL. Both of us had daughters called Allegra and both had so named the girls after one of Byron’s daughters. We try to forget that Byron’s poor little Allegra (daughter of Claire Clairmont, step sister of Mary Shelley) had been hived off to live in an Italian convent where she had died aged 5. Fortunately both our Allegras passed the 5 year mark and are into their thirties, thriving and with offspring of their own. But our meeting on Chiswick Back Common forged a bond which has lasted even after the Americans returned to California and my first marriage had broken up. American Allegra had married 6 years ago and I owed her and her husband a wedding present. I had long ago designed a monogram for the couple, so I needed to waste no time with pencil and paper. 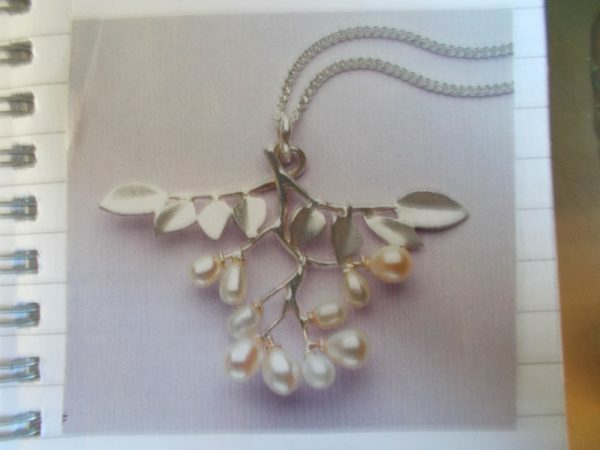 (My design was based on a scrapbook picture of a pearl and silver necklace which is shown below. The little silver twig reminded me of mistletoe, so I drew my leaves and berries to look a bit more mistletoey.) With a deadline 5 days away I set to, feeling confident that the task was quite easily doable. Then the drains intervened…and after their unblocking, the ensuing backlog of piles of clothes washing and the general dross of temporarily disordered lives loomed large – so loud and unavoidable was their siren call, that all other activities were cast aside including my monogram with the tight deadline. 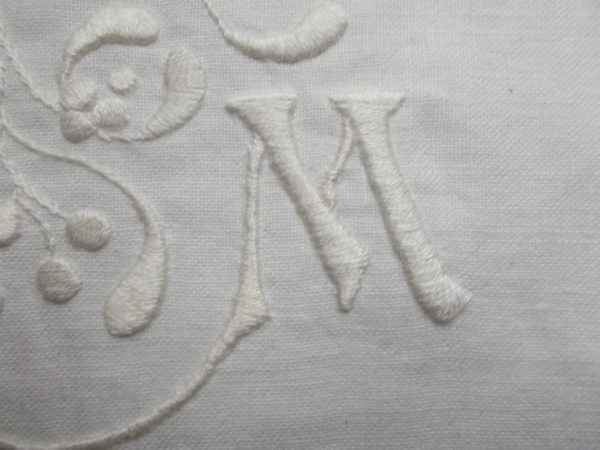 Of course the monogram was not finished and framed in time for our friends to take with them. It is, however, finished now and can be packaged up ready for their next visit to the UK. 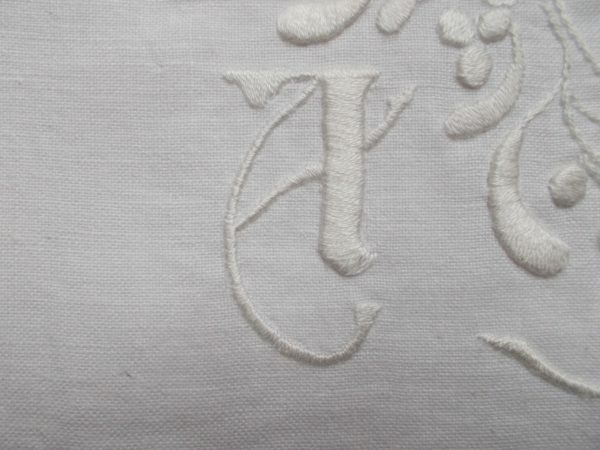 On a practical note, I’d like to record that I used Anchor No 2 – a slightly yellowy white – which gleams with a light gold sheen on white linen. 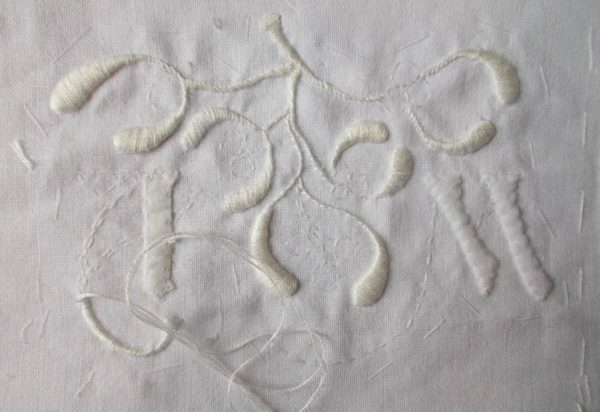 People often ask to see work in progress so I enclose a photograph of the start of embroidery. I had copied the design from a pencil drawing using a light box. Having zigzagged the edge of the fabric, I backed the design with a stabilising fabric like Stitch N Tear to give a firm base for embroidery as I don’t enjoy using a hoop. 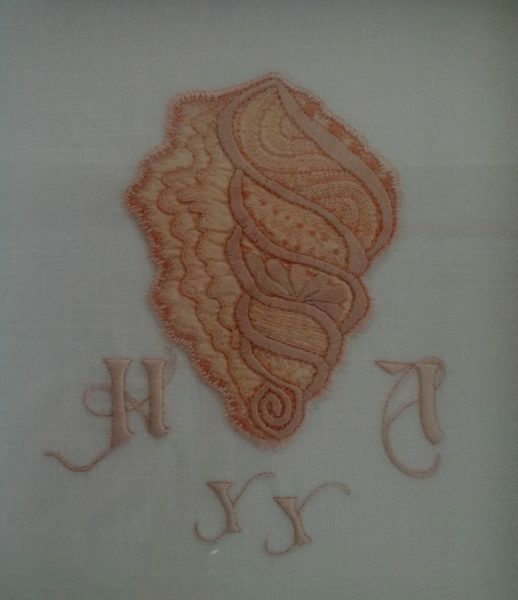 The design was then picked out in 2 strand embroidery thread running stitch. Next it was washed with special attention to removing the pencil lines. Rolling the wet fabric in a clean tea towel, I follow this by ironing it between two clean tea towels while still damp and I then leave it lying flat to really dry out for a few hours. When I come to embroider I might embroider over the lines I’ve already stitched but I often remove these threads as I go, using the stitch holes for guidance. 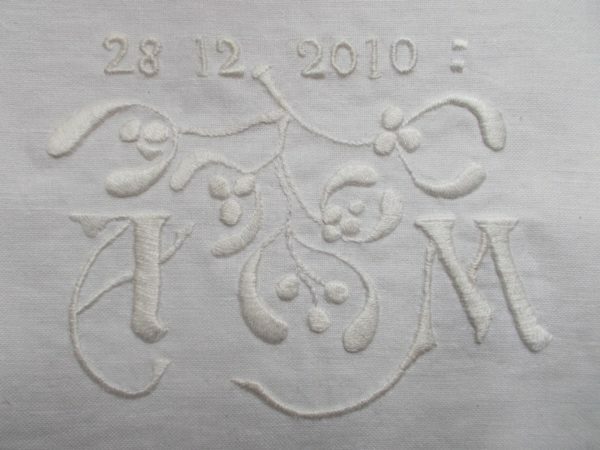 When the embroidery is completed, I cut or pull away the stabiliser fabric. 6pm last Friday we thought we were heading out of the house for a hotel as a day of digging and prodding by an army of workmen failed to discover the source of the blocked drain. The whole of the front garden had been dug up and earth removed down to a metre or so and still there was no sign of a drainage pipe. Old fashioned action with multiple rods continued via the flooded drain inspection hole in the back garden and suddenly, hooray, they were through to the main drain in the middle of the road and life as we knew it could resume. How relieved we were to be returned to C21st living. What a chapter of horrors! I’m so glad to hear that normal service has resumed. 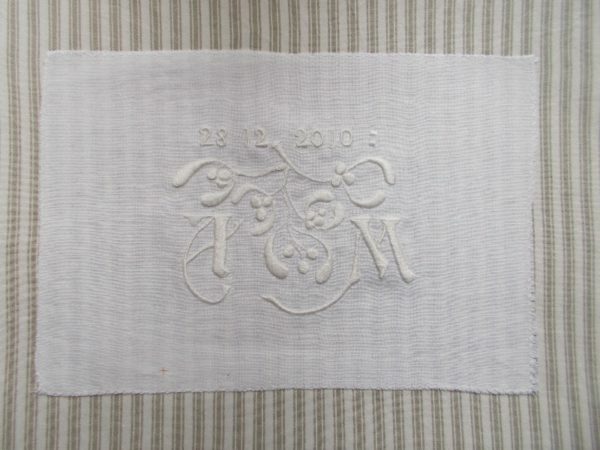 And even if you missed your deadline, you did a lovely job with the monogram! It’s positively luxurious to do load the washing machine up without fear of the garden covered with an unpleasant scum of dirty water! Your embroidery is an inspiration. Especially when one realizes it has been accomplished under very adverse circumstances. I loved the cushion in your last post too – your choice of colours was perfect. Anne, it’s so kind of you to comment. The truth is that things are never quite so bad as a few dramatic sentences suggest and there’s nearly always a good hour or so in the morning to get on with a bit of sewing when it’s something you really want to do.